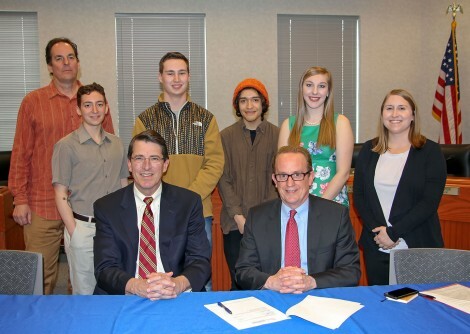 DELAWARE, Ohio – Ohio Wesleyan University and the City of Delaware signed a memorandum of understanding today creating a permanent OWU student internship within the city’s Department of Public Utilities and formalizing additional opportunities for city-campus collaboration. The memorandum was signed today by Delaware City Manager Tom Homan and Ohio Wesleyan President Rock Jones with Ellis, Krygier, Cicerchi, and other city and university representatives witnessing the event. Ellis said she hopes more such agreements are forthcoming.